I had intended many things for today’s blog, but they will have to wait. We had a day of strong winds and high temperatures yesterday so we decided to go down to the beach for a cool down swim, a walk, and then fish and chips for dinner. As we were driving home from Byron Bay to the farm we rounded a corner to find a huge tree down over the road. I was so glad Ben was driving. He braked and slammed the car into a sideways skid to slow us down and we stopped about six inches from it. The tree had brought live power lines down and they were hanging just above the roof of the car, flapping madly in the wind. We managed to clear enough branches away to make a safe passage for a single vehicle, and a driver who’d come to a halt on the other side of the tree called the electricity company who shut off the power. When the road was safe for other drivers we came home to our dark little farmhouse, where the torches always sit just inside the front and back doors for just such an emergency and lit candles and made ourselves comfortable. We’ve had a blackout ever since, and it seems quite a number of power lines are down in our area, so I’m not expecting power to be restored any time soon. Instead I’m blogging on my iphone. It’s okay. We’re all safe and I’m sure the power company has things under control. And anyway, I had a lovely time out in the back yard with the torch last night, spotting owls. I also spied a HUGE magpie nest in the top of the hoop pine. And I counted a gazillion stars. It was wonderful to sit in our sheltered part of the valley, hearing the roar of the wind above us, but to feel safe and protected. Ben and I made chai tea on the gas stove, lit candles and talked as we sat outside on the chairs under the tree he’s wrapped in fairy lights. The dogs had a great time running around on the grass, hyped up from the wind and the novelty of being out late. It made for a magical evening. Life. It never goes according to plan. But I’m beginning to see the blessings in that. I hope the unexpected turns in your road today bring positives too. This entry was posted in Farm life and tagged blackouts, candles, date night, power outages, storms, wind by Cauldrons and Cupcakes. Bookmark the permalink. I’m glad you got home safely. Sorry you have no power but what a wonderful way to make the best of the situation. I adore candles Nicole and have them on every evening . 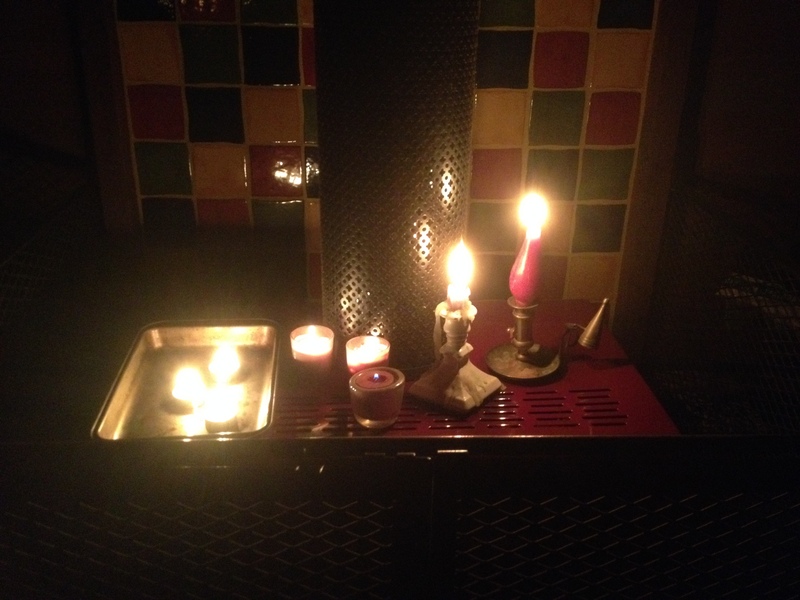 I love the mystery, and magic that surrounds them … I don’t wait for a power cut. I grew up in 1970’s miner strikes, when we lived with candles and we kids loved it , it was a beastly time for the miners and their families …never to be forgotten . Glad you are safe and hope power is restored.